Understanding Each Other – Hi Blog! I'm Dad. When your child is non-verbal, however, that knowledge isn’t as cut and dry. My son goes through the same motions as any other child – both in learning and leaning on others to do things he can do himself. Despite his autism and delayed understanding in many areas, he makes advances on his own timeline. Since he doesn’t speak, though, there are no moments where he can tell me that he knows what I’m expecting or that he can handle a situation. A lot of it boils down to confidence in my own observations. I can use his morning bus routine as an example. Each day, the driver pulls up and Lucas eagerly runs out the door. All is great until he gets past our threshold and suddenly falls into a daze. Staring down the block, he barely looks as he shakily walks up the stairs to his seat. The matron smiles and has to help him as he leans back into her with each successive step. If she doesn’t hold his back in place, he’ll fall right to the ground. “Oh Lucas. Come on, kid. What are you doing?” I ask through her polite laughter. In her mind, this is how he walks up stairs. It’s all she sees and, without her there, he’d tumble backwards. It’s also a complete conjob by this little scammer. He knows damn well how to walk up a few steps. I’ve seen him scale the stairs in our house countless times – sometimes when I explicitly tell him not to. With this bus matron, though, he suddenly forgets all motor functions as it relates to stair climbing. Sure, I can force the situation and make him climb on his own, but that wouldn’t solve much. For starters, the aid doesn’t mind doing it. Also, there are a whole busload of kids to deliver to school on time. It just doesn’t seem like the right time for a personal victory. I let him have his little moment the same way I let my daughter get away with not saying hello to the crossing guard so long. Even worse is that there are some instances where he’s not faking it. In the case of stair walking, I know he can do it. Some other situations aren’t so obvious. As any parent of a child with special needs can tell you, there are high moments and low ones. Sometimes they can happen within minutes of each other. There have been plenty of glowing positive examples with Lucas quickly followed up by crash-and-burn negative ones. Just when you think, “Nice! He understands absolutely everything”, you’re brought back to reality. It can be extremely hard to reconcile in your head and not only because of the negative experience itself. It’s because it can remind you that you’re still far away from fully understanding someone you love so much. It works in the opposite way too, though. The sharp pull to Earth after going from a high to low can swing the opposite direction. I tell this story often and it’s one that I will never forget. It must have happened about a year or so ago. I was in the kitchen when Lucas came shuffling in with his little blanketsleeper feetie pajamas. He approached the pantry and gestured towards the box of Ritz crackers. I knew he loved these little crackers. Sometimes for snack at school, I’ll give him nothing but a handful of them. Like Regarding Henry, he loved his Ritz. Lucas tapped his chest twice to signify that he wanted it. I was so proud that we were finally starting to interact more easily. There were times where we could never understand what he wanted, but those days were over. We could finally communicate. Smiling, I reached into the box all ready to hand him one just as he asked. As I did, he immediately ran out of the room. To say I was unhappy would be an understatement. I shook my head and began mumbling to myself as I put the box back. How could he run off? He knew what he was asking for. He came into the kitchen. He pointed to the food. This is ridiculous. How could he not know? I continued to huff and puff under my breath until I looked up. And saw him perfectly sitting at the dining room table in his chair, quietly looking up at me to deliver his crackers. I can still see that entire scene as if it happened yesterday. That was major for us. It ranks up there with a lot of milestone moments that other parents would be more familiar with. Things changed that day in many ways. It’s not just about Lucas understanding me or if I can understand him. It’s about us knowing that we understand each other or at least try to. Hopefully that makes some sense. I know there are things that he doesn’t get about my world. There are things about his world that I don’t get. The things we do both understand, though, are special. I may spend the rest of my life trying to better grasp the thoughts of my little guy. He might do the same with me. One day we might suddenly get it, one day we might not. 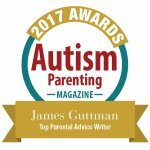 We’re trying, though and, at the end of the day, Autism or not, that’s the most important thing any parent and child can do for each other. Hi! I commented on your link on facebook about how I liked this peice as an autistic person. But I would like to voice something and hope it will be kindly accepted. I don’t know your child, but I would like to offer something from my perspective about the bus thing. It’s possible you’re right about it being a con, kids are kids and that may well be the case, but as an autistic person I can verify that my abilities vary based on the situation and day by day. There are certain things I am capable of at home but was not capable of at school, including certain motor functions. The bus was always a giant trigger for me, I shut down a lot on the bus. I required an aid on the bus as well. Unless your entirely sure this is a farse and not the product of some kind of stressor, I would be careful about assuming he is choosing not to rather than him not being able to. Hi. I totally hear what you’re saying. I only believe that he’s milking it a bit because this is actually his second bus/aid. The last one didn’t help him at all and he’d race up the steps on his own. This one tends to be more helpful so he goes limp. It doesn’t make me upset at all. If anything, I laugh in my head. I didn’t mean to imply that what he’s doing is all that bad. In fact, I like it. It’s similar to what lots of kids his age do. When they’re learning something and someone comes along to help, they just let them. I wanted people to know that he’s a lot more like other children than people may realize. He does the same sweet things (and mischievous ones) others do. Thank you for commenting too. Since starting this blog, I’ve gotten to hear from many people who have really broadened my horizons with parenting both of my children. I appreciate it. Comments like yours have helped me better understand both my son and how I relate to him. Thanks!